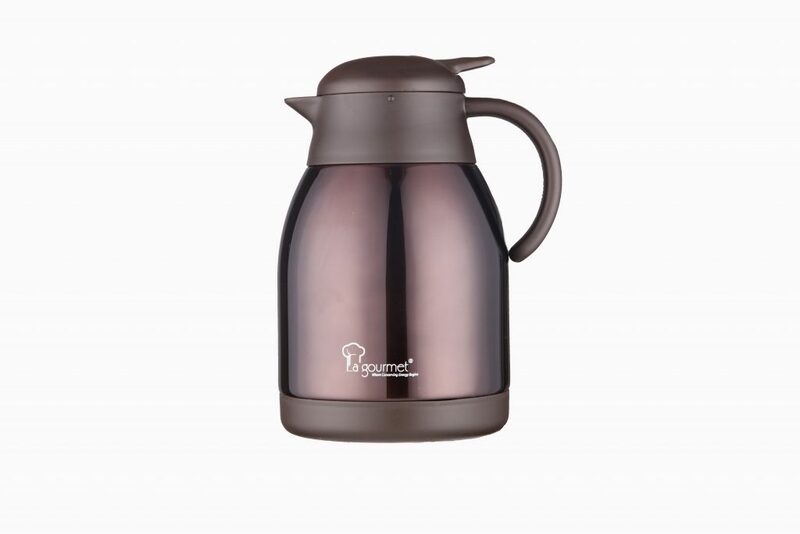 WHY BUY La gourmet Thermal Coffee Pot ? Since 1990, La gourmet has been built on the twin core principles of ” Conserve Energy ” and ” Healthy Living” . La gourmet is committed to help protect our planet by producing products that promote a healthy lifestyle while helping to preserve the environment La gourmet’s ” ‘ Love Our Planet’ campaign is a choice that La gourmet has taken to focus n products that are Eco-friendly. Health related studies have shown that many plastic and lined aluminium bottles leach toxins such as Bisphenol A ( BPA ) . 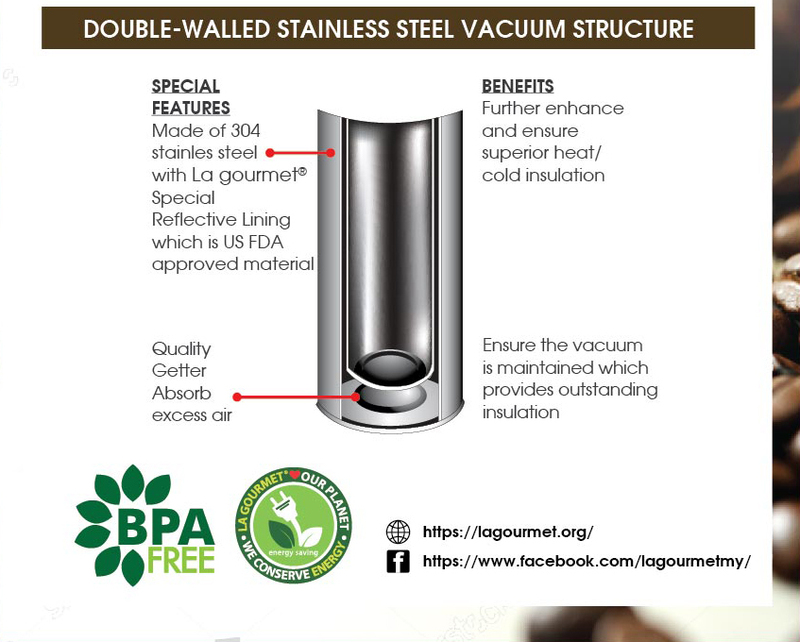 La gourmet Thermalware has been developed to be the solution to these problems as it is made from high quality grade 18/8 stainless steel .La gourmet 18/8 stainless steel is BPA Free, non – leaching and toxin free making it a healthy and safe alternative to lined metal or plastic containers. Congratulations o your purchase of a ” La gourmet ” product . You are now part of the La gourmet family and we appreciate your confidence in our products . La gourmet products are manufactured to the highest quality standards . Please rad the instruction manual carefully so you can get the best out of your La gourmet Thermalware . Before first use please clean your La gourmet products with warm water and dish-washing liquid . Using a cleaning brush with soft foam head will make the task easier. Do not use metal or hard plastic cleaning brushes . Remove stains by adding a mixture of hot water and vinegar or lemon juice into the flask / mug and soak for several hours, empty and rinse thoroughly . For very stubborn stains you can try a mixture of bicarbonate soda and hot water . Soak for several hours before rinsing. Dry with lid removed from the thermalware. Best results are achieved from your La gourmet Thermalware by pre-rinsing it with hot water for hot drinks and cold water for cold drinks. Do not overfill the La gourmet Thermalware. The ideal liquid level should be 2-3cm below the rim to avoid spilling when re-opening and to prolong the life span of the silicon ring by not always soaking in the hot liquid . Ensure both the outside cover and the inner stopper are always tightly closed. *For outer flask paint protection , DO NOT use abrasive scourer . Use a soft sponge for cleaning .Other wise paint will be faded over a period of time. * Do not use in the microwave/oven. * Do not use over direct flame. * Milk products and baby food are not recommended to use for the flask, as vacuum insulation would cause bacterial grow rapidly and tend to get sour within few hours . 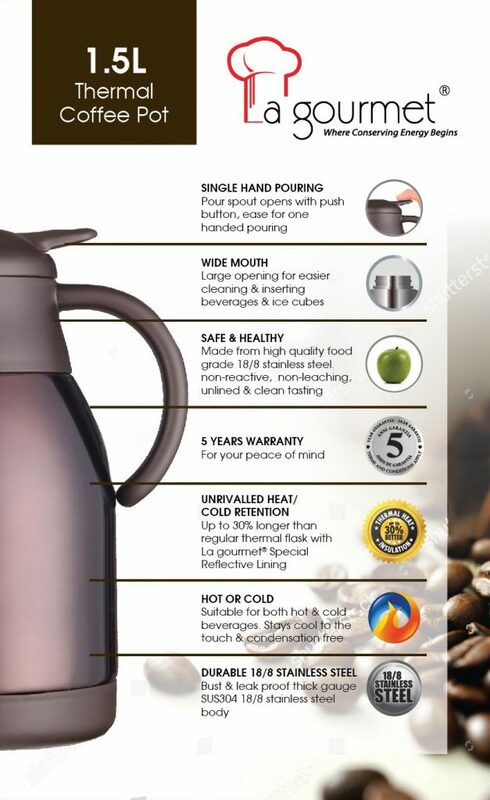 * Ice may be used in this unbreakable stainless steel vacuum thermalware . However DO NOT use carbonated beverages or dry ice . This may cause the stopper to eject forcefully. * Do not put can of beer/beverages inside flask in order to prevent damage of out of shape . La gourmet Thermalware Series is warranted free from defective materials and workmanship for a period of 5 years. This warranty does not cover damages due to normal wear and tear of the products .